An easy, crowd-pleasing Sunday dinner that makes for extra meals and snacks for days! Dinner Doubles as Meal Prep! Love it when Sunday dinner doubles as meal prep! We we were in full swing holiday mode with another busy week ahead, I needed a dinner that was easy, crowd-pleasing, and would make for extra meals and snacks in the next few days. I was a woman on a mission! Vegan falafels, homemade hummus with a festive twist, quinoa and grilled organic chicken for the boys. Perfect! These vegan falafel bites are a favorite of ours. I went with things we had made before in some capacity, so I knew what I was getting into. 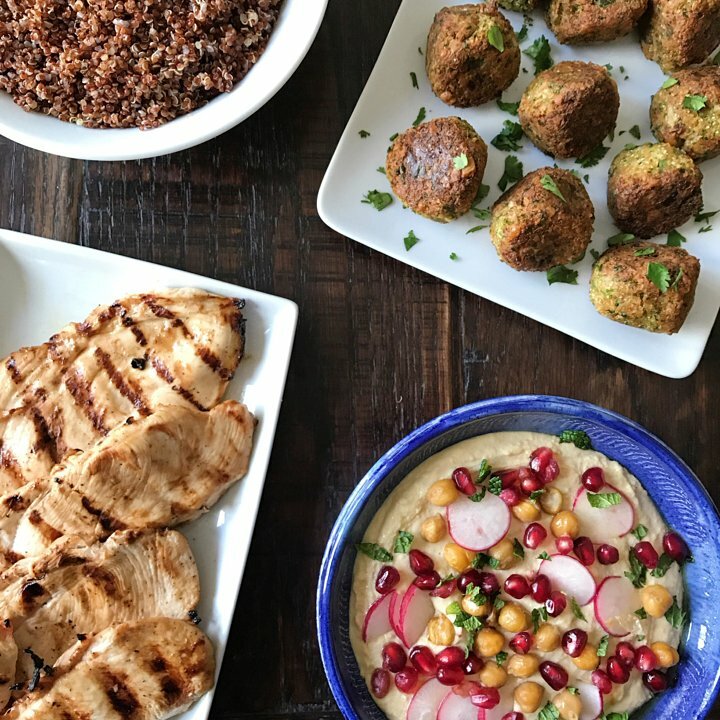 We love falafels and have tried so many recipes — this is a good one! The recipe from Cotter Crunch is easy to make, packed with flavor and nearly grain-free, as the base is a broccoli/cauliflower “rice”. The quinoa recipe is from Ancient Harvest. Lots of goodness and plenty of extras for the next few days!